Un amigo de nosotros está postulando para ingresar en el seminario y tenía que escribir un ensayo sobre “La Iglesia.” Ha escrito sobre algunos temas y desafíos muy comunes que enfrentan las iglesias de hoy: la disminuición de membresía, ¿cómo ser relevantes en el mundo?, cuestiones de sobrevivir. Y estoy seguro de que estos son los problemas que el seminario quiere resolver. Pero creo que estas preguntas realmente son las preocupaciones de instituciones humanas (sean iglesias o no) y tienen muy poco que ver con “la Iglesia.” En cambio las imágenes en la Biblia que son más orgánicas, por ejemplo “el cuerpo de Cristo” o “Yo soy la vid, vosotros los pámpanos,” señalan algo bastante diferente. Si estas imágenes son correctas, entonces la vida y naturaleza de la iglesia no están decididos atravéz de nosotros, sino de Cristo. No es nosotros, nuestras elecciones o acciones o reglas, que hace la iglesia lo que es. Es Jesús. La iglesia es la manifestación colectiva y comunitaria de Jesús en el mundo. Si Jesús no está en ella, no es la iglesia. Si no tiene la misma manera de Jesús, obediciendo a él como cabeza, haciendo su obra, amando con su amor, entonces no es la iglesia. Realmente no es un asunto que nosostros decidimos o hacemos suceder. No es un asunto, ni desafío, ni cuestión que nosotros solucionamos. La iglesia es, y no puede ser ningún otra cosa, Cristo. Obviamente, con eso ya resolvemos la cuestión de “sobrevivir” también. Nuestras instituciones pueden morir (todas lo harán al final, cada uno de ellas). Pero Cristo no morirá. Al menos, la resurreción demuestra eso. Así que nosotros no tenemos que preocuparnos que la iglesia no permanecerá. No es un asunto que tenemos que tratar de solucionar; si estamos luchando por permanecer, queda muy claro que nuestra lucha no es por la iglesia. La iglesia vive porque Cristo vive. La iglesia es compasivo y valiente y santo porque estos son los atributos de Cristo. Esos no dependen de nosotros. Lo que depende de nosostros se trata de eligir ser parte de su iglesia o no. Si aceptarémos la invitación y el abrazo de Jesús o no. Si nos dejarémos estar dirigida y inspirada y movida por Jesus o no. La dirección y naturaleza y membresía de la iglesia no están en nuestras manos. Solamente podemos aceptar la iglesia que Jesús nos ofrece, o rechazarlo. Y no es suficiente tomar la decisión una vez, sino en todos momentos para siempre. Here in Lima we are enjoying and adjusting to my beautiful (sometimes not so beautiful) Peruvian culture. At times I can’t believe how different things can be from the way we live in Chico. Adjusting with our two kids can make those differences seem sharper. For example, this morning Gabriela had been awake for about 45 minutes (with no breakfast yet) and she comes running to our room with a bag of M&M’s that her uncle gave to her and her cousin. Jason and I looked at each other and laughed. Then we asked my sister and brother-in-law to hold off on the candy until they ate some real food. We have been spending a lot of time with my extended part of the family as well. My grandma on my dad’s side is 97 years old. For the first time she didn’t recognize me immediately. She has Alzheimer’s, but other than that she is pretty healthy and does everything by herself. It amazes me how strong she is. My other grandma is also very active and physically strong. She is so hospitable and always asks about our life in the U.S. This grandma lives in a big corner house on a busy street next to a park. We see neighbors, dogs, kids, bicycles, slow moving cars passing by her house all day. 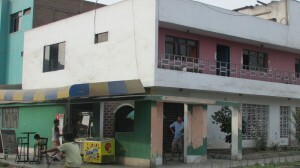 It’s pretty much a communal building, with three generations of family members living within two flats and a bakery storefront run by an aunt on the first level. That is our favorite place to hang out. We sit outside in the bakery’s seating area or just lounge around inside talking, eating, laughing most of the day. And I mean it when I say laughing! Life here is so simple, I think. People don’t seem to be worried about the next day’s chores or responsibilities. When we leave the neighborhood, things can get pretty interesting as well. 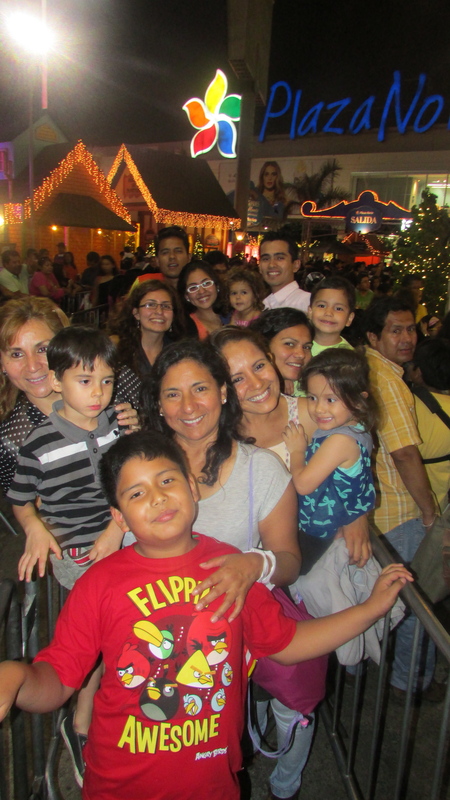 Sixteen of us took a trip last week to a place called Casa de Papa Noé (Santa’s House) which is a very Americanized/commercialized version of Christmas fun. But everyone wanted to go and everyone was able to pay for it. Just getting in was like a zoo because of how many people were t here. I am not kidding, we had to walk around holding our kids tight because there were hundreds of people herding through the lines and booths. It reminded me of standing in line for a ride at Disneyland, lol. If I had known what we were getting ourselves into beforehand, I probably wouldn’t have gone. My kids were great sports about it all, though, and without any treats or kid-stuff to get through the lines. All we had was each other–cousins, aunts, uncles–to entertain each other. And guess what? We all had so much fun. 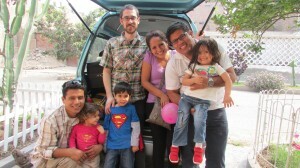 Another thing we are getting used to is the time it takes to get ready to go anywhere in Lima. I am realizing more and more that we CANNOT do more than one activity per day. We are definitely not in Chico!! To leave the house, it takes about two to three hours of getting ready. I am not kidding, especially when 16 of us are leaving together. Then it takes about an hour and a half to get from one place to another each way. And guess what? This afternoon we are doing it again!! I’m so happy we’re doing it, though. The whole process is an adventure and there is always laughter in the midst of the chaos. And last but not least, we have our own personalized alarm clock each morning at 7:45am. There is a guy that sells tamales on the street. He yells out: “Tamales!! Tamales!! Tamales!! Ricos tamales! !” lol. He’s got some lungs, let me tell you. We love him.